I have been thinking about this pasta for a while now…sometimes I wake up in the middle of the night and I think about some new recipes, and this one has been occupying my mind lately. I love colors everywhere, and I love especially colorful and vibrant food in my plate, and this is just the right balance of colors, flavors and textures. 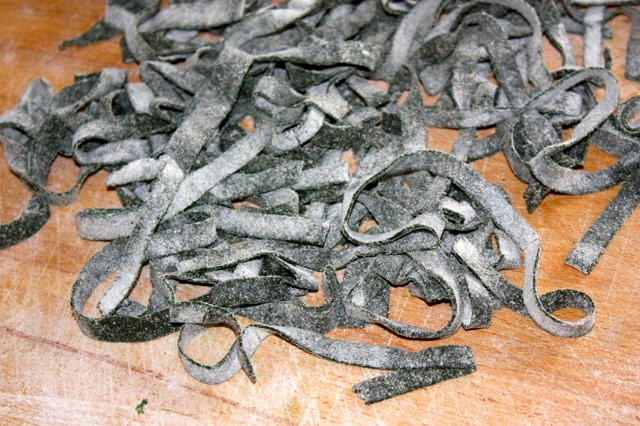 The first time I discovered spirulina was in France, it was a dried store bought pasta with spirulina. I had no idea what spirulina was until then. After some research, I found out that spirulina is a blue algae used as a supplement before workouts (either in a pill or as a powder), so I tried it, and I liked its boosting effect, but it tastes like a strong raw seaweed (quite unpleasant). Being high in protein and amino acid, I have been using it as a supplement. The thought of making some pasta with it, kept coming to my mind, and I had to come to an end with this recurring thought. It worked as planned. You end up with beautiful green pasta similar than spinach pasta but without bad seaweed flavor when used as a supplement in a drink. 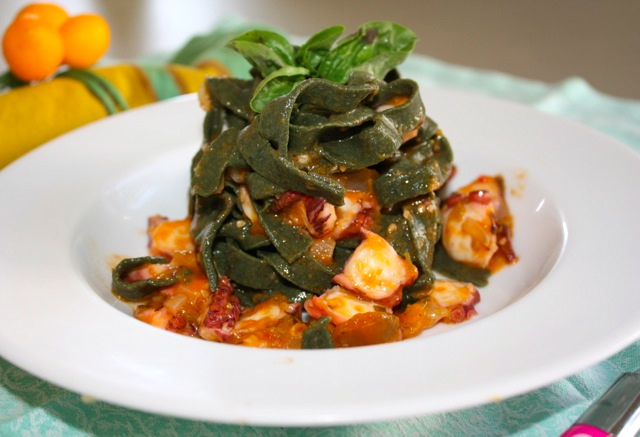 Spirulina being a seaweed, any fish or seafood based sauce would be ideal. You can use shrimps or seas scallops as well. I have a weakness for octopus…even though, I have a little dilemma with octopus (ever since I found out about Paul the octopus), it’s an intelligent animal so I feel a bit guilty to eat it even though I like its flavor and texture. Here I used whole grain farro and buckwheat flours but you can also use some other flours of your choice. If you use this combination, I used a ratio of 60/40 (farro/buckwheat), I would not advise to use less than 60g of farro with buckwheat since buckwheat has no gluten so the texture might end up being a bit fragile and the pasta might break in the cooking process. For the octopus, I usually buy it whole and raw. Some Chinese or Japanese stores sell them precooked in small portions, so if you are not too familiar with its preparation, that would be an easier alternative. If you buy it raw, it needs to be cooked in water (with cloves, bay leaf, celery, carrot, onion) for about 45 min or until tender. Then you need to slice it and use it in the stew. Heat olive oil in a pan, add shallot and let it soften. Add basil, parlsey and garlic and cook until fragrant ensuring no to burn the garlic. Add tomatoes and cook for about 7 minutes, then add wine and let it reduce. Add the octopus and cook for an additional 10 min at low heat. In a container or large wooden board, mix flours and spirulina. Add egg and mix well, kneading the dough forming a ball. Knead the dough for about 5-10 min. Add flour if sticky. Using a pasta machine, or rolling pin make tagliatelle (noodle shape pasta). Let the pasta dry for about 15 min. Bring a large salted pot of water to boil. Add pasta and cook for a few minutes until the pasta comes floating at the surface. Do not overcook. Drain and serve with the sauce. 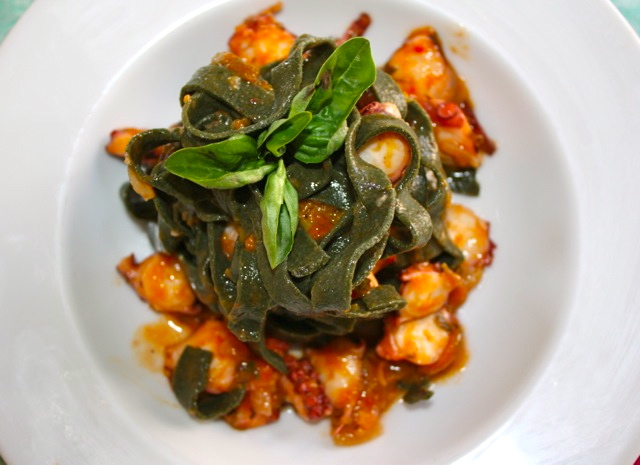 This entry was posted by silvia on October 4, 2015 at 11:06 pm, and is filed under Fish/Seafood, Pasta. Follow any responses to this post through RSS 2.0.You can leave a response or trackback from your own site.